prior to the dinner and Friends of Scouting portion of the court of honor program. Troop 50 Scouts, leaders, and families gathered at First Presbyterian Church on Monday, Dec. 15 for food, fellowship, and awards as part of its annual Christmas court of honor and party. The evening offered a chance for the troop to highlight the hard work of Scouts' advancement efforts, to install new troop leadership, and to celebrate giving and fellowship of the season. In addition to collecting toys for the Auburn Fire Department's "Toys for Tots" program, Troop 50 joined together in support of the Chattahoochee Council's "Friends of Scouting" program. Charter Organization Representative Michael Tullier offered a brief overview of the FOS program and invited families to consider contributing in support of the council's fundraising initiative. By the end of the meeting, troop families had exceeded its fundraising goal by contributing or pledging more than $2,500 in support of the council. Scoutmaster Baird, SPL Will, and incoming SPL Andrew. Senior Patrol Leader Will, with the help of Scoutmaster Andrew Baird and incoming Senior Patrol Leader Andrew, presented four merit badges and 16 ranks to Scouts in the troop. Ranks ranged from the Scout rank for the troop's newest Scout, to Star rank earned by Scouts who joined the troop just 18 months ago. accept the oath of office from Scoutmaster Baird. Wes Williams, and Billy Lytle. Following the presentation of awards, Scoutmaster Baird called forward the troop's recently elected youth leaders to be installed. At the troop's Dec. 8 meeting, Scouts elected Andrew, a founding member of the troop, as its new senior patrol leader — the second time during his tenure in the troop to be elected to serve in this capacity. Andrew selected outgoing SPL Will as his assistant senior patrol leader. The troop also elected Louie and Josh as new patrol leaders — the first opportunity for either to be elected to serve in these positions. Finally, Michael was appointed to the post of troop guide. hug-the-scoutmaster moment of the evening. Mr. Baird continued to highlight troop leadership by officially installing the troop's newest Eagle Scout, Ethan Smith, as junior assistant scoutmaster. He also presented assistant scoutmaster position patches to three of the troop's newest adult leaders: Billy Lytle, Wes Williams, and Will Levendis. Scoutmaster Baird concluded his focus on troop leadership by paying tribute to the leadership shown by outgoing SPL Will during this two consecutive terms as senior patrol leader. To commemorate Will's commitment to the troop, Scoutmaster Baird presented Will with a handmade wooden neckerchief slide featuring the profile image of a Native American chief. The presentation resulted in a spontaneous hug — Mr. Baird's second one of the evening! Scouts and some of the leaders gathered around for the "Dirty Santa" gift exchange, where there seemed to be a carefully selected gag gift for every practical one opened. A variety of camping gadgets became hot commodities that were stolen a few times during the gift-swapping. the troop to the fire department's annual Toys for Tots toy drive. 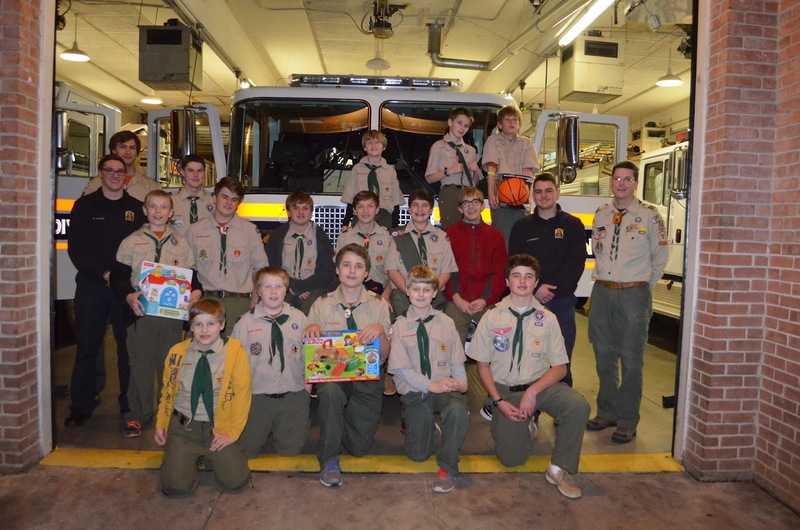 Following the gift exchanges, Scouts and leaders ventured from the church to the Auburn Fire Department, delivering the toys donated by the troop's families. Toys for toddlers, board-game players and sports fanatics were all part of the dozens of items donated for less fortunate children in the community who are helped through the firefighters' annual toy-drive program. The troop will take off the next few Mondays to enjoy the holidays (and the the vacation from school) with their families. The troop's next regularly scheduled meeting is Monday, Jan. 12, 2015. For more photos from the court of honor and Christmas party, visit the troop's online photo album.